My creative process is based on working intuitively from feelings, memories and my imagination. I usually work in a series which can lead me into extensive exploration of an idea and form. Form is an essential element in my work. My secondary focus is to develop different types of surfaces that will enhance and support the form. I have explored surfaces by continuous testing of ceramic materials and kiln firings. I can't say enough about color. In many ways, color is the most important part of every piece I make. The dance begins as soon as I start brushing the glazes onto bone dry terra-cotta. The clay draws the slips and glazes in, sometimes making a particular sound; I like that. I layer the slips and glazes until I achieve a result which is emotionally satisfying to me. The use of color is more emotional than logical. Although my figures are pared-down minimalist in outside appearance, I mean for them to have complicated and subtle inner lives. For me, they carry the heavy weight of emotional fragility. I scratch and scar the clay both literally and metaphorically to capture the essence of these figures. They are simultaneously grotesque, beautiful, repulsive and mesmerizing. The figures I create, some creepy and dark, are not to be found on the street, but rather in one's imagination or dreams creating an alternate universe. Wondering how to live in the world with others...this is my way of speaking through my art, my way of being in the world. While married and raising my son I became interested in Ceramics. Starting with classes and numerous workshops with leading sculptors and ceramists, I evolved into a full time ceramic artist working from 1985 to the present. 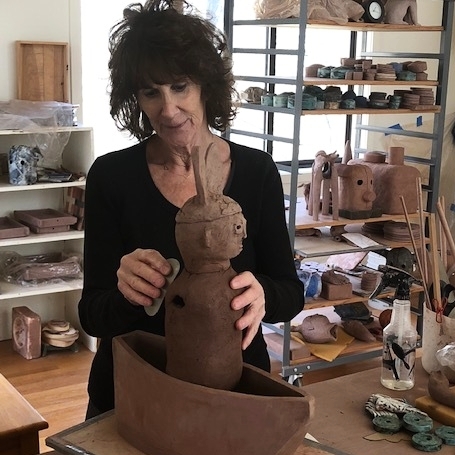 I live in South Salem, NY maintaining a studio space at home and at Clay Art Center, Port Chester, NY. My use of wagons, carts, wheels, boats and chairs place the figure in or on an object to transport them to another place. COPYRIGHT 2018. All Rights Reserved.